Gilbert's War is an animated short film about one young man's extraordinary rescue from no-man's land on a french battlefield during the First World War. An uplifting tale of the power of the human spirit amid the horror of the trenches, Gilbert's War will reinforce your faith in humankind. Gilbert's War is very much still in progress. As a family we've had some very tough situations to deal with/decisions to make over the last few months but I'm now back on track and working hard to get Gilbert's War's scheduling where I want it to be. I'm currently working with something called ragdoll physics. This is a process that turns a 3d character model into - quite literally - a rag doll with loose joints that is affected by it's environment. In video games, typically when a 3d character is incapacitated (shot or otherwise killed) it's animation skeleton is 'switched off' and ragdoll physics take over. The character falls to the ground. The aim is to be able to quickly place fallen soldiers and horses on the battlefield and have them look natural, not posed. I'll be placing character models as casualties (soldiers and horses) just above the battlefield and turning on the simulation, which will allow them to tumble to the ground and settle. I'll probably go in and pose a few afterward - do a little tweaking if they've landed awkwardly. This whole process is unnerving and difficult to deal with. I don't know whether I'll put up any pics of this in action, maybe I'll just show the regular soldier and horse models. After a lot of work behind the scenes, our new website (and new studio) mannimation.co.uk launched last night. Gilbert's War is now in the care of Mannimation Studio and will progress as a flagship title. It's great to finally have a studio name and a business footing to develop ideas like Gilbert's War. There'll be lots of other content on the site too, news on CGI developments, tutorials covering Blender, Flash and other areas of animation and of course updates on our ongoing projects. After a long hiatus, Gilbert's War is back on track. Setting up the freelance animation company has taken a lot of time and energy over the last months as has teaching in animation at the Isle of Man College. Interest in the Great War is ramping up as we progress through 2014 and the Manx Museum is about to unveil a fantastic looking new display featuring those men, women and children from the island who experienced those years of conflict. Unfortunately I wasn't able to contribute the massive amount of info I have on Gilbert since he wasn't Manx. I'm hoping to get in touch with organisations in Leeds to see if similar events/exhibitions are planned so I can tell Gilbert's story in the city of his (and my) birth. Sorry for the wordy post this time, but there's a lot to get in. As is inevitable with a long term, ambitious project like this, life has taken a few turns of late and I find myself behind schedule. I've moved from one full-time job to another, discovered that the new job is not the job for me, left that and started up as a self-employed freelance animator and art/animation lecturer. My finishing date for Gilbert's War may (okay, will definitely) slip as a consequence, since working for myself is all-consuming, in that I have to go out and find the work as well as do it. I've also taken the opportunity to look at the design of Gilbert's War while I can, and I think I have a new direction that will greatly benefit the appeal of the short. The overall tone will not change, it's just slight but obvious changes made to the fabric of the piece having stared at it for this long. So, I'm looking at going 3d for the characters. One of my fears was having the film look like every other CGI short out there. I wanted to keep the hand-drawn element for human characters as a physical and visual connection between me and Gilbert, but I now know I can achieve the same with specific design choices. I know a lot about the technology of animation, specifically in how it relates to modern CG practices, particularly for video games, and I plan to harness that technology, make it work for me to enhance what I can achieve as a crew of one. So, there you are. I'll post new material as soon as I have any to show. Work on the screenplay continues, and I'll post some snippets in the near future. This is the ship that brought a wounded Gilbert safely back to Blighty, only to be sent back to the front to fight for the remainder of the war. There are monochrome photographs out there, but this fabulous colour painting is by William Albert Edward Jeneway, a ships steward who loved to paint and who sold many of his paintings to passengers aboard ship. 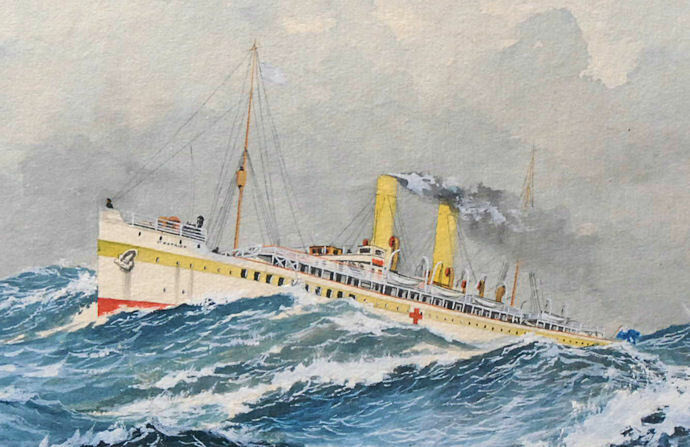 He painted HMHS (His Majesty's Hospital Ship) St Patrick at the very time it was being used to ferry the British wounded back from the Western Front. It's the perfect reference for Gilbert's War. I can't ask for better than that! Whilst researching Gilbert's life and family through online ancestry sites, I got in touch with a guy called Glenn from Canada. Glenn is related to me through Gilbert's family, and he has some photographs that I've never seen. The most outstanding one for me is one of Gilbert's dad, Walter. 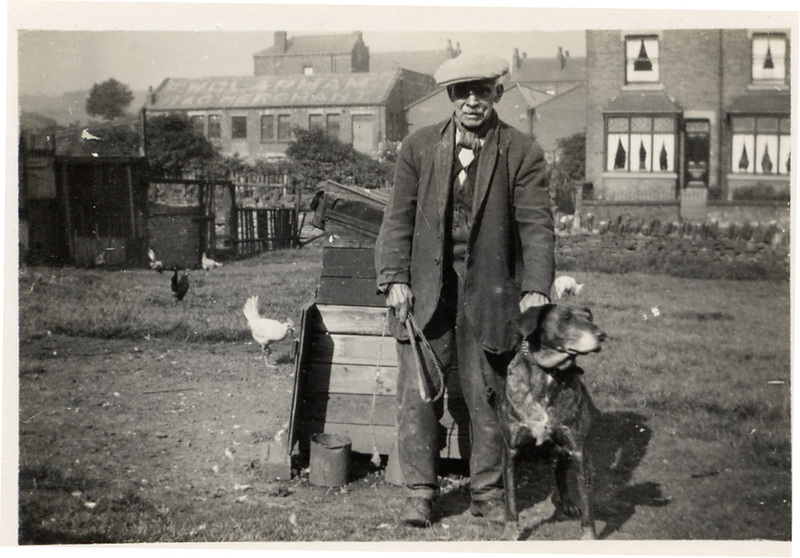 He's seen here in a small patch of ground in Wortley, Leeds, surrounded by his chickens and one of his pigs (visible behind his left hand). With him is his dog (name unknown) and in his right hand is a switch, a small whip (I presume for the dog). I look forward to uncovering more wonders like this, as I keep digging to fill out the picture of how Gilbert lived.